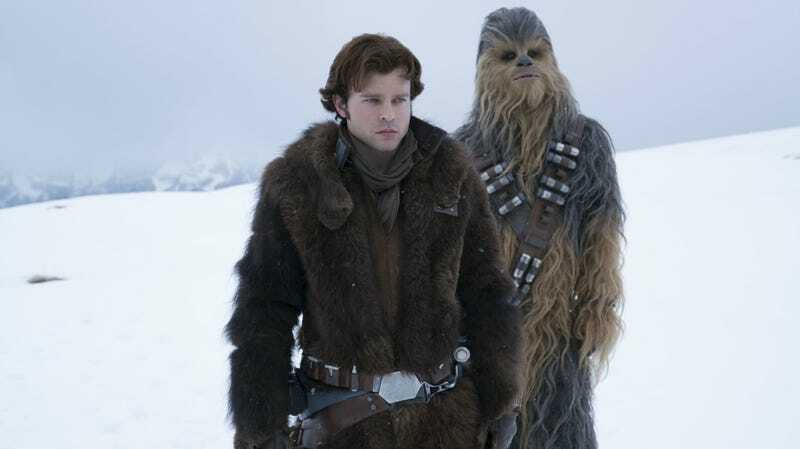 Han Solo and Chewbacca start their partnership in Solo: A Star Wars Story. Did everyone do their homework? Did you see Solo: A Star Wars Story over the long weekend? (Obviously, not everyone did.) Either way, we have some lingering questions about the movie and how it affects the Star Wars universe. We have some educated guesses, but there are two dozen answers we’d very much like to get. Han and Chewie the first time we meet them in A New Hope. This is the point everything is leading to. It’s never been officially stated, but the belief is that the bulk of the events seen in Solo occur about 10-15 years before Star Wars: A New Hope. That puts it before Rogue One as well as Star Wars Rebels, which began five years before Episode IV. This means Solo takes place only five to 10 years after Revenge of the Sith. How was the Imperial recruiting station playing “The Imperial March” theme? Qi’ra is one of the most fascinating characters in Solo. What happened to Qi’ra after Han left her on Corellia? For the most part, we have no idea other than that Dryden Vos says he helped her out of a bad situation. Certainly, major things happened to Qi’ra in the three-year jump in the movie, since she somehow went from Corellian prisoner to Crimson Dawn lieutenant. We’ll have to wait and find out what those things are, though. However, we do know a few thing about her life before Solo, thanks to the novel Most Wanted. What the hell is up with Han’s name? In one of the weirder moments of the film, Han is asked his last name by an Imperial recruiter but doesn’t give it to him. Because he’s alone—something you’d think would happen a lot—the recruiter names him “Solo.” This is a key moment in Han’s life as he’s leaving one life behind and reinventing himself as someone new. As a symbolic gesture, the name change makes sense. (Side note: This moment is actually what sold Disney on the movie.) But not only is it more than a little cheesy to realize this classic character wasn’t named by his family, but instead by a random Imperial officer, Han talks later about how his father built Corellian freighters like the Falcon. Did his dad not have a name? Or did Han renounce it for some reason? It certainly seems like it. After being captured by the Empire, Han is thrown into a dungeon to be fed to a beast, who we quickly learn is Chewbacca. But the Imperials on the surface joke that Chewie hasn’t eaten in three days. Obviously they think Chewbacca will eat the deserter, but more importantly it seems highly unlikely Han was the first prisoner they fed to the Wookiee. So even if humans aren’t exactly the number one dinner choice of Wookiees, it seems that in a pinch, they’ll do. Since A New Hope we’ve known that Han understands Chewbacca’s language, but in Solo, he actually speaks his language. Maybe, like how Thor knows “Groot,” shyriiwook is an elective at Corellian High... which Han certainly didn’t attend. Someone must have taught Han, obviously, but we don’t have the faintest clue how or why. Han and his trusty DL-44. Why hasn’t Han ever used the full version of his gun? One of Solo’s many reveals is that Han’s trademark DL-44 blaster is haphazardly given to him by Beckett. Before that, though, Beckett takes the blaster out of a larger, multi-piece rifle. Han is obviously pretty skilled with the blaster alone, still using it decades later, but you’d think at some point maybe he’d want to upgrade it back to its original form. The moment when Thandie Newton’s character, Val, kills herself is one of the most disappointing things in Solo for a lot of reasons. It’s also very confusing because the heist, while big, didn’t exactly seem worth dying for. However, we think the reason she had to kill herself was that the other options were even grimmer: 1) Fight the viper droids and die (some have said she should’ve just defeated the droids, but the film makes it clear she tried and failed at that); or 2) Let the train pass, everyone is captured, and they all probably die. The third choice—sacrificing herself as a hero and giving the love of her life a chance to escape with the bounty—was a problematic decision for sure, but since she was probably doomed no matter what, it ultimately seems to be the best one in a very bad situation. What are the Easter eggs in Dryden Vos’s office? When the characters enter Dryden Vos’ office, most moviegoers probably snapped to attention because of all the mementos and trinkets laying around. And, of course, the filmmakers couldn’t help but put Easter eggs in there, like Mandalorian armor, a piece of his desk made of rock from below a Sith temple, and a crystal skull—which is more likely a nod to the novel Han Solo and the Lost Legacy than Indiana Jones (seriously, check out the cover of the book, located at the bottom of this tweet). That’s because Lucasfilm has confirmed there’s a nod to Lost Legacy in the movie, but also because the idol from Raiders of the Lost Ark is hanging out in Dryden’s office, and it would be a little weird to have two Indy references there. There’s more to Lando than meets the eye. Throughout Solo, Lando constantly drops proper names of places in the Star Wars universe, either in casual conversation or in his hilarious “Calrissian Chronicles” self-recordings. We see Lando... reframing the truth several times during the movie, and despite his assertion that “all the stories you’ve heard about me are true,” it seems incredibly likely that he’s exaggerating his awesomeness in them. Fun fact: Lando’s adventures are all references to L. Neil Smith’s The Lando Adventures book trilogy, such as Oseon, the Starcave Nebula, and Sharu. He also mentions Felucia, a planet seen in Revenge of the Sith and The Clone Wars. So while that doesn’t make the Expanded Universe novel canon, it’s a nice nod. Also, L3-37 mentions “Black Spire,” which was recently announced as the city fans will go to at Disney theme parks. The white-skinned, orange-haired, female bounty hunter who had a brief cameo in The Phantom Menace and then became a featured player on The Clone Wars died off screen courtesy of Beckett, most likely while she was hunting him down, which Lando loves cause he owed her money. It’s a strange way for a fan favorite character to go, but it’s something we may see in a comic or novel at some point. Yes! And if you don’t know what that means, you are in for a treat. In the film, we learn that Qi’ra was taught a martial art by Dryden Vos called Teräs Käsi. That also happens to be the name of a 1997 PlayStation fighting game which pitted Star Wars characters against each other in the style of Street Fighter or Mortal Kombat. The game was absolutely terrible—for a lot of reasons—and has long been a joke among fans. For the fighting style to now be canon is a very funny wink to the fans. In Solo, we learn where the Millennium Falcon was built, we learn Lando won it in a card game, and we see Han Solo win it from Lando in another card game. But, we’re still just curious who has owned it in the past. Who first bought it? What’s its history? All we know at the moment is that the Falcon was spotted on Coruscant in Revenge of the Sith, likely well before Lando owned it. There are some books and stories coming out soon that will deal with this a little, but the way the Falcon itself has almost become a mantle (with Rey now flying it) gets well established here. Han, you may be getting in the middle of something here. The relationship between Lando Calrissian and L3 is more than that of just pilot and co-pilot. They’re good friends and allies, yes, but L3 also seems to think Lando loves her; shortly after that, she informs Qi’ra that physical love between human and droid “works.” Of course, none of this definitely answers the question about their potential intimacy, but it definitely seemed like Lando was losing more than a friend when L3 died. After L3 dies, Lando uploads her navigational systems into the Falcon, declaring she’s now part of the ship. The question is, it is just her nav system or her deeper consciousness? Is L3 trapped in the Falcon forever, or is she just plain dead? This has become an internet debate of late and it comes down to perception and interpretation. Until an official story tells us for sure either way, we’re in the dark. But if you want to believe L3 is the Falcon? Fine. Or if you want to believe it’s just her special navigational system? That’s fine too. Worth noting, though, in the original trilogy C-3PO does mention the Falcon’s operating system has a “peculiar dialect” which could potentially be a clue. Lando’s ship is about to go for a ride. Near the end of Solo, we learn that Enfys Nest is a rebel pirate who took the mantle of the character from her deceased mother. We don’t learn more than that, really, but we hope we do soon—it seems like a very cool tradition that could even turn back up decades later, in future Star Wars movies. In the Expanded Universe, when Han saved Chewbacca, that means Chewie, as a Wookiee, owes him his life. Han also saves Chewie in Solo, kind of, but it might be more accurate to say they just escaped an Imperial prison hole together. Either way, there’s no mention of any life debt, so until we hear otherwise they’re just friends working together. Though we can’t be sure yet, it seems like this piece of Star Wars mythology has been discarded. When Han wins the Falcon from Lando, he mentions beating him “fair and square,” which is exactly what he says to him in The Empire Strikes Back. The implication is that, maybe, they haven’t seen each other since. However, in Empire Han knew Lando had conned Cloud City from someone. Plus, if there were more Solo (or Lando) movies to come, they’d have to meet up again, right? We’re betting these two scoundrels will certainly see each other again before Empire Strikes Back, although we don’t know for certain. Darth Maul as seen on Star Wars Rebels, which is set after Solo. We don’t know for sure. However, the writers of Solo explicitly said Maul is in this movie to hint at the future. We also know he wants Qi’ra to come visit him on his home planet of Dathomir to work together more closely. You have to think he and Crimson Dawn will play a larger role in any future Solo movies, or maybe even the recently announced Boba Fett movie. Solo is all about Han and Qi’ra searching for freedom. And, at the end of the film, they both get it, just in very different ways. Qi’ra obviously doesn’t abandon Han for Maul lightly, but will her allegiances really be just to Maul? Or will Han, eventually, be able to swing her back? Does she die before A New Hope? Or could she actually make a reappearance in Han’s life between Return of the Jedi and The Force Awakens? Ultimately, the coaxium that Han and the crew steal from Kessel ends up being worth about 60 million credits. It’s the kind of money that could set him up for life and then some. But, instead of keeping it, Han gives it to Enfys Nest to help fund a rebellion. But are the Cloud Riders part of the Rebellion? Sort of. We know that during this time there were many small rebel cells across the galaxy during this time, and they didn’t completely unify until the Rebel Alliance was formed during the Rebels cartoon, several years after Solo takes place. But if Enfys Nest’s group became part of the Alliance, it’s possible they’d still be using the riches Han gave them; if so, it’s pretty likely they’d contribute their credits to the Rebel cause. Which means, in a way, Princess Leia would be paying Han for rescuing her with the money he himself stole, which is kind of hilarious. With the introduction of Maul, Qi’ra’s decision, a potential reference to Jabba the Hutt, and several years to fill, obviously, there is plenty of more story to tell before Han Solo goes to have a drink in a certain Tatooine cantina. Star Alden Ehrenreich has signed on to star in at least three movies, although after the disappointing opening weekend, it seems unlikely a trilogy of Han Solo films is coming. However, this version of Han doesn’t have to just appear in Solo movies. Like Thor or Iron Man, he could very easily pop up elsewhere, like, say, a Boba Fett movie.